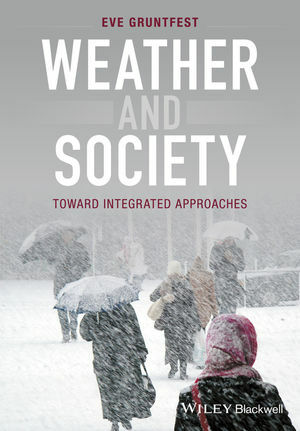 Weather and Society is a hands-on guide for academics, students and professionals that offers a new approach to the successful integration of social science concepts and methodologies into the fabric of meteorological research and practice. DR. EVE GRUNTFEST is a geographer who has devoted her career to breaking down the barriers that separate social science and atmospheric science. She is Professor Emerita from University of Colorado at Colorado Springs where she taught for 27 years. She has published widely and is an expert in the areas of warning systems and flash flood mitigation. During her career, she served on five National Academy of Science committees. She directed Social Science Woven into Meteorology (SSWIM - www.sswim.org) and is co-founder of the Weather and Society * Integrated Studies (WAS*IS) movement. She was a program officer in the Atmospheric and Geospace Sciences Division at National Science Foundation and a member of the National Oceanic and Atmospheric Administration's Science Advisory Board.